Sticking to your guns might signal strength, but is it always the best course of action? And when is it better to “sprint” versus focus solely on the long game? In this opinion piece, Wharton dean Geoffrey Garrett reformulates three common leadership truisms. When I was preparing to speak with a group of senior executives at Wharton’s recent CEO Academy in New York on what it takes to do their jobs, I was worried that my remarks would amount to nothing more than a litany of leadership clichés. Then it struck me, why not turn some time-tested truisms on their head? Here are three popular clichés from the leadership playbook that can get you into trouble, and my reformulations to help make your leadership more effective. 1. Stick to your guns. Strong leaders “stick to their guns” – maintain their core beliefs, commitments and strategies – in the face of daunting odds, right? “This lady’s not for turning” was Margaret Thatcher’s version of this, her personal badge of honor amid spiraling British unemployment in the early 1980s, and her template for conviction-based leadership. Sticking to your guns is valued because it signals strength, courage and commitment under adversity, which is why we so often think about war heroes in this way. But what happens when sticking to your guns proves to be the wrong strategy? You have to embrace a different cliché. In the words of country music legend Kenny Rogers in “The Gambler,” leaders need to “know when to hold ‘em, know when to fold ‘em.” There is no simple score sheet to tell you when the positives from sticking to your guns become outweighed by the negatives. But the world is littered with examples where leaders wait too long to make the switch. Think General Lee’s historic defeat at Gettysburg in the American Civil War, Jeff Immelt at GE or John Chambers at Cisco. Most leaders will change course eventually because there is not much valor in heroic defeats. But the best leaders will change course long before the writing is on the wall. Compare the demise of Kodak with the transformation of IBM. But how do you know when the writing is on the wall? The answer is judgment, arguably the most valuable trait in a leader. It’s easy to recognize in hindsight, because good leaders make good decisions—the definition of good judgment. Judgment, however, is hard to identify and even harder to develop. And judgment matters most in context, in its application to a specific organizational environment. And that brings me to my second cliché. Albert Einstein’s motto for life is said to have been “question everything.” Being intellectually inquisitive is essential to a fulfilling life, and to a successful career. It is also true that leaders need always to be questioning standard operating procedures in their organizations: Why do we do things this way? Is there a better way? Why haven’t we changed? How can we change? The problem with verbalizing questions when you are a leader is two-fold. On the one hand, it makes people defensive. Questioning almost invariably implies criticism, or at least is taken that way by those being questioned. All the more so when the questioner is the boss – after all, wouldn’t leaders only ask the questions if they were worried something was wrong? On the other hand, when a leader asks a question, it is often viewed as a leading question. If leaders ask a question, those being questioned will invariably believe the leaders already have a good idea about the answer—even when they don’t. How do you square the circle of questioning everything without questioning everyone? Active listening is an essential element of every leader’s personal tool kit. Leaders should also promote a culture in which everyone feels comfortable and confident, supported and encouraged to say what they think. Leaders should also always be mindful that their personal behavior will have a big impact on the success of meetings they chair. When you chair a meeting, your proximate goal should be for you to frame the issues, then get out of the way. Foster a climate in which others will feel free to share their perspectives, no matter how “left field” they are, and then only return to center stage to sum up the sense of the meeting and outline next steps for the organization. 3. It’s a marathon, not a sprint. It’s not easy constantly assessing when to hold ‘em and when to fold ‘em, and questioning everything without questioning everyone. 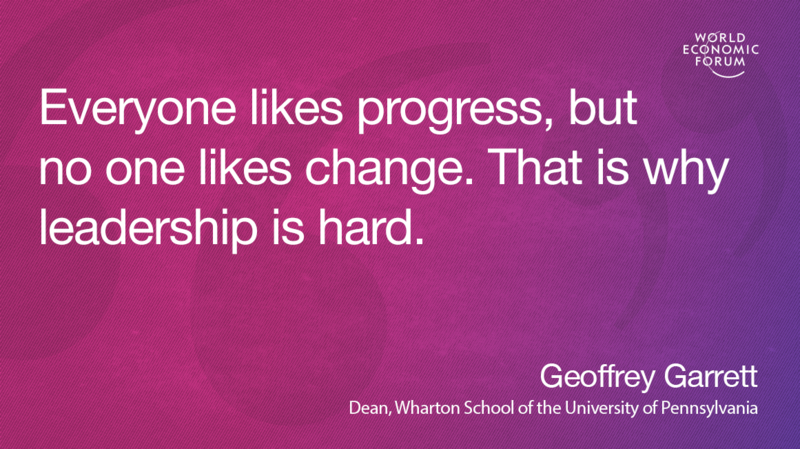 And as one of my senior colleagues at Wharton always reminds me: Everyone likes progress, but no one likes change. That is why leadership is hard. To make a difference means empowering change, and the most important changes are often in organizational culture. That takes time, and that’s why it is important for leaders to take the long view. So, naturally, comes the last cliché: “It’s a marathon, not a sprint.” However, while leaders must embrace this “long game” mentality, there is still the daily reality of leadership: Every day is a sprint. The definition of sprinting is to give everything you’ve got for a focused period. I often think about this in terms of meetings. If you are a leader, it is likely that every meeting you have is the most important meeting of that week or month for the other people in the room. If you are managing your time and conserving energy and focus, if you approach each meeting as just one mile in a marathon, everyone else in the room will feel this—and they will feel slighted. I also think about it in terms of my personal productivity. If I am not operating at my best, I feel so bad about underperforming that I am sure it exacerbates the problem. Leaders must always be “on,” functioning at their very best. That is a lot of sprinting. But how do you perform best in sprinting? If you run wind sprints across a basketball court – sprint to one side, immediately turn around and sprint to the other side, then repeat, again and again – your performance deteriorates within a couple of sprints. Great for fitness, but terrible for performance in the later sprints when you can barely crawl across the court. That’s why there are limits on the number of hours surgeons can spend in the operating theater or pilots can spend in the cockpit. As a leader, no one is going to regulate the number of hours you spend working for yourself. But the same principle applies. Hence my rewrite of this last cliché: “It’s not a marathon; it’s a series of sprints.” To perform at your best in every sprint, you need time to recover. To be your best as a leader, you need time to recharge. Burnout is not only bad for you, it is also bad for your organization. If you are the boss, no one will tell you when to stop working and how to look after yourself. But knowing yourself well enough to know when to stop working and how to recharge your batteries is essential to being a successful leader.